There is no other instrument that will sound and look as beautiful as a harp. I have two beautiful Triplett Harps - a concert lever harp fitted with an internal microphone so it can be amplified, it projects very nicely acoustically, and a smaller portable harp is best suited for small rooms and intimate gatherings, and garden weddings. I am always honored to be a part of life events and work with you to make sure your special day is everything you envision it to be. Morningside Music also offers a duet package of Harp & Guitar if you wish to have a fuller arrangement on your wedding day. The Morningside Project is a collaboration between Sohayla Smith and Joshua Oatman. We explore Celtic, traditional, classical, original, and popular music together - working out suitable background music for events, as well as solo pieces that stand alone. 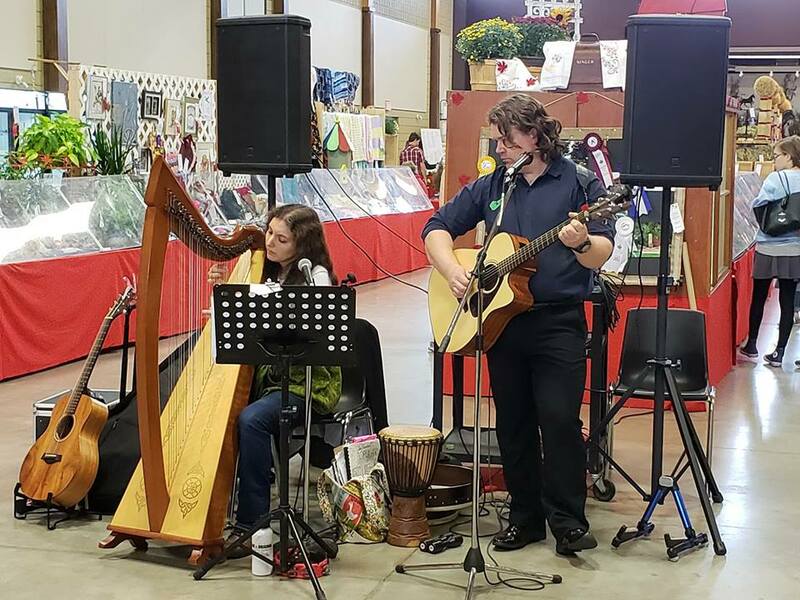 Sohayla Smith and Josh Oatman have performed at Alton Mill Arts Centre for photos with The Grinch 2018, 2018 Collingwood Art Crawl, 2018 Christmas at Heatherlea Farm Shoppe, 2018 Ancaster Fair, 2018 Eden Mills Arts Festival, Alton Mill Arts Centre, 2018 Spring Open House - Get Your Celtic on, as well as opening an evening concert at the mill featuring headliners, NUA, and Travel-Worn, 2017 Spring Open House - Get Your Celtic On!. December 2017, Sohayla performed What Child is This on the harp for the Christmas Concert in the Church at the Dufferin County Museum & Archives as part of Troupe-Adore's theatre skit, and at the Farmhouse Pottery Gallery and Cafe for Sharon Wadsworth-Smith's art show in the fall of 2016, in addition to garden weddings, various seniors residences, and community farmer's markets. In September 2017, Sohayla and Josh began professionally providing monthly harp music therapy for Dufferin Oaks. In June 2018 Morningside Music begins professional music therapy for Shelburne Long Term Care Home, as well as occasional music for Avalon in Orangeville, Ontario, and Lapointe-Fisher in Guelph. ​In their spare time, Sohayla and Josh volunteer at the seniors homes in Shelburne, Ontario, (Shelburne Residence and Dufferin Oaks), playing music for the residents there. Music helps seniors retain and access memory, aids speech for post-stroke patients, rhythm helps Parkinson sufferers, classical music also increases cardiovascular health. Sohayla Smith and Josh Oatman, of Morningside Music Project, performing in Marritt Hall, for the Ancaster Fair, 2018.